None of the Above is an important book. Written by a surgeon, I.W. Gregorio, this YA novel is about a teen with AIS, Androgen Insensitivity Syndrome. While I was familiar with intersex, I didn't specifically know about AIS. This book is an invaluable resource for intersex teens as well as nonintersex teens who should know all the colors of the QUILTBAG rainbow. Since the '90s, YA literature has become more inclusive of LGBT characters, but I think this may be the first major book dealing with an intersex main character in a positive way. 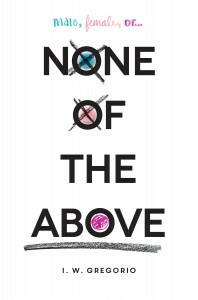 None of the Above is important for how straight forward and informative it is about Kristin's intersex body and about the realities of bullying and harassment that she has to deal with. If this book were not about being intersex, if it were about a typical girl navigating high school relationships, it would be rote and unremarkable. The non-intersex aspects of the story were formulaic; relationship rifts and resolutions were telegraphed early on. Gregorio's style is uncomplicated and simple, with a mission to teach and elucidate. While the book is informative, I wished it could be even more so, but then I am primarily a nonfiction reader. I had unanswered questions, such as how Gretchen's mom knew that she was intersex at six. I would have loved to see more consequences of Kristin's gonadectomy and attendant menopause. However, I know other readers resist didacticism. and want to read about friendships and teenage drama. None of the Above will educate and open minds of teens, parents, and educators. As with other pioneering diverse books, I hope that this is just the beginning of a flowering of inclusivity.